26 Grams Per Scoop! Increased Protein Synthesis And Nitrogen Retention! Extreme Increases In Muscle Size And Strength! 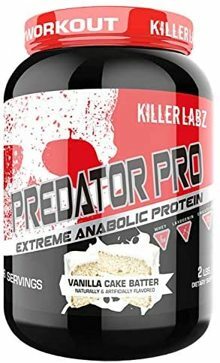 In terms of macros, Predator Pro features a fairly common combination of nutrition numbers. The supplement is led by 26g of protein from a blend of whey concentrate and isolate, 4g of carbohydrates with a gram of that fiber and 3g sugar, 2.5g of fat (1.5g saturated), and 140 calories. According to Killer Labz, Predator Pro is going to be available sometime later this month. The brand’s first ever protein powder is due to release in the one 25 serving, 2lb tub size with two delicious sounding flavors to choose from in Brownie Bites and Peanut Butter Cookie.